BACKGROUND AND PURPOSE: Postoperative diffusion-weighted MR imaging (DWI) often discloses new lesions after carotid artery stent placement (CAS), most of them asymptomatic. Our aim was to investigate the fate of these silent ischemic lesions. MATERIALS AND METHODS: We prospectively studied 110 patients undergoing protected transfemoral CAS, 98 of whom underwent DWI before and after the intervention. Patients in whom DWI disclosed silent postoperative lesions also had delayed MR imaging. Preoperative, postoperative, and delayed scans were compared. RESULTS: Of the 92 patients without postoperative symptoms, DWI disclosed 33 new silent ischemic lesions in 14 patients (15.2%), 13 of whom (30 lesions) underwent delayed MR imaging after a mean follow-up of 6.2 months. In 8 of these 13 patients (61%), MR imaging disclosed 12 persistent lesions (12/30, 40%). The reversibility rate depended significantly on the location (cortical versus subcortical) and size (0–5 versus 5–10 mm) of the lesions (P < .05 by χ2 test). CONCLUSIONS: Because many silent ischemic lesions seen on postoperative DWI after CAS reverse within months, the extent of permanent CAS-related cerebral damage may be overestimated. 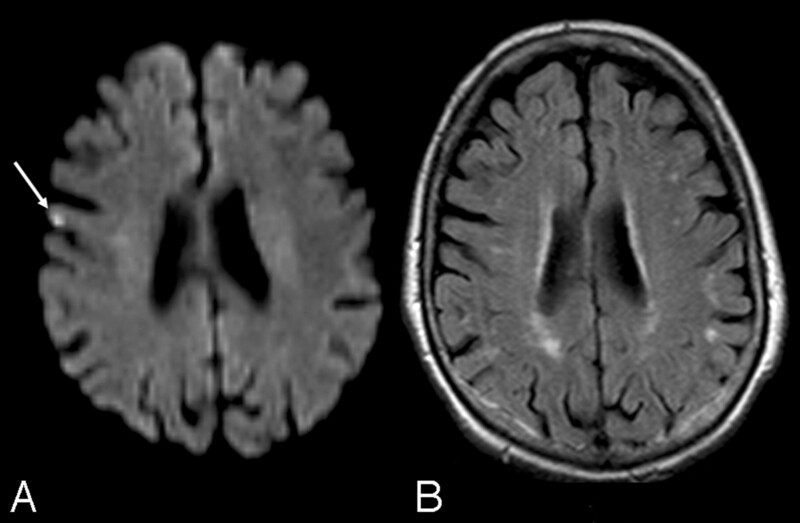 Despite widespread use of cerebral protection systems in patients undergoing endovascular carotid interventions,3,4 diffusion-weighted MR imaging (DWI) of the brain, currently the most effective tool for diagnosing acute cerebral ischemia,5,6 detects a high incidence of asymptomatic ischemic lesions after CAS, ranging from 21% to 54% for unprotected procedures7,8 and from 21% to 40% for protected procedures.9–13 Few studies have described the late outcome of early postoperative DWI lesions.14–16 Whether these silent ischemic lesions cause permanent brain damage with cognitive impairment or merely transient ischemia without sequelae remains unclear. In this prospective study, to investigate the extent of permanent cerebral ischemic damage in patients undergoing protected CAS, we used postoperative DWI and delayed MR imaging to assess the outcome (patient and lesion reversibility rates) of asymptomatic ischemic lesions after CAS and studied factors potentially influencing reversibility. We prospectively included in our study 110 patients (78 men, 32 women; median age, 72.6 years) who underwent CAS at our institution from October 2004 to July 2006. Except 4 patients who had a restenosis from a previous endarterectomy, all patients had atherosclerotic stenosis of the internal carotid artery (ICA). The severity of the stenosis was evaluated with duplex ultrasonography, by using morphologic and velocimetric criteria. The plaque structure was defined according to the classification of Geroulakos et al17: type 1, uniformly echolucent; type 2, predominantly echolucent with <50% of echogenic areas; type 3, predominantly echogenic with <50% of echolucent areas; type 4, uniformly echogenic; and type 5, not classifiable, owing to heavy calcification producing acoustic shadow. In all patients, a gadolinium-enhanced MR angiographic scan of the aortic arch and supra-aortic vessels was obtained before treatment to confirm stenosis and to assess the anatomic features. Symptomatic patients with at least 70% carotid stenosis were included after transient ischemic attack (retinal or hemispheric) or nondisabling stroke (modified Rankin scale score, <3) experienced within 6 months before the intervention. Asymptomatic patients (no ipsilateral neurologic symptoms in the previous 6 months) were included if they had at least 70% carotid stenosis. Exclusion criteria were standard contraindications to MR imaging, presence of a subtotal stenosis or endoluminal thrombus, and excessive vessel tortuosity precluding endovascular access to the carotid lesion or filter deployment. The baseline characteristics of our patients are listed in Table 1. All patients were scheduled for CAS because of comorbidities, old age, or patient's preference; and all procedures were performed by a vascular surgeon with long experience in endovascular procedures. Every patient received 300 mg of clopidogrel orally 1–3 hours before the procedure and 5000 IU of intravenous heparin after sheath placement. During prolonged procedures, if an activated clotting time of <250 seconds was found, the patient received an additional 2500 IU of heparin. After treatment, patients received daily medication with 100 mg of aspirin and 75 mg of clopidogrel for 6 months. Thereafter, clopidogrel was discontinued, whereas aspirin was maintained indefinitely. In all patients, CAS was performed by the percutaneous femoral approach. Because patients underwent preoperative aortic arch assessment with gadolinium-enhanced MR angiography, none of them had diagnostic intraoperative angiography of the cerebral vessels. For cerebral protection, we routinely used an FiterWire EZ (Boston Scientific, Nanterre, France) deployed in the distal ICA (100 patients). When the distal ICA measured >6 mm in diameter, an AngioGuard filter (Cordis, Miami Lakes, Fla) was preferred (6 patients). In stenoses of >90% (4 patients), we used the Spider monorail filter (ev3, Irvine, Calif), because it has a low crossing profile. Of the 110 patients, 6 underwent predilation with a 3 × 20 mm balloon catheter. In all patients, a self-expandable stent (carotid Wallstent, Boston Scientific; Precise carotid stent, Cordis) was delivered over the carotid bifurcation and then dilated with an appropriate balloon. Wallstents were preferred in patients with a straight course of the carotid artery (88 patients), whereas the more flexible Precise nitinol stent was used in tortuous bifurcations (22 patients). MR imaging of the brain was performed before and after treatment with a 1.5T whole-body system (Magnetom Sonata; Siemens, Erlangen, Germany) equipped with a head coil. The cerebral MR imaging studies included axial T2-weighted fluid-attenuated inversion recovery (FLAIR) and DWI sequences. FLAIR sequences had the following parameters: TR, 8000 ms; TE, 100 ms; TI, 2200 ms; FOV, 240 mm; thickness, 3 mm; turbo factor, 14; NEX, 2, intersection gap, 0.3 mm; matrix, 256 × 256 mm; and acquisition time, 1.40 minutes. The DWI sequences were obtained in 3 orthogonal planes with 3 levels of diffusion sensitization (b-values = 0, 500, and 1000 s/mm2) by using the following parameters: section thickness, 5 mm; TR, 3000 ms; TE, 84 ms; intersection gap, 0.3 mm; matrix, 256 × 256 mm; and acquisition time, 1.40 minutes. MR imaging was performed within 3 days after CAS. When the MR imaging scanner was not available within 3 days, the patient was excluded. In patients with silent postoperative DWI lesions, an MR imaging follow-up scan was acquired by using a FLAIR sequence with the foregoing parameters. The primary outcome variable was the “patient reversibility rate,” defined as the number of patients with at least 1 postoperative lesion who had no lesions at follow-up, and the “lesion reversibility rate,” defined as the percentage of postoperative lesions that disappeared on MR imaging during follow-up. To evaluate outcome, 2 experienced neuroradiologists who were not involved in the carotid procedures compared the follow-up and postprocedural images with those acquired before the intervention. The number, location, and diameter of new ischemic lesions were recorded. Disagreements were settled by consensus. Ipsilateral lesions were those on the side of the treated carotid artery; contralateral lesions included those located in the vascular territory of the untreated carotid artery or vertebrobasilar arteries. According to their anatomic distribution, lesions were classified as cortical, subcortical (just below the cortex), and deep white matter (when located in the centrum semiovale). As possible factors influencing the lesion and patient reversibility rates, we evaluated location, size, MR imaging–documented microinfarctual brain, age ≥80 years, sonographic evidence of echolucent plaque, and patients’ clinical presentations (symptomatic or asymptomatic). All patients underwent neurologic examination before and 24 hours after the procedure. New cerebral deficits persisting >24 hours were recorded as stroke, the severity of which was graded according to the modified Rankin scale. Major strokes exceed 3 on the Rankin scale, whereas minor strokes do not. A χ2 test was used to calculate between-group differences in data for factors influencing the lesion and patient reversibility rates. A P value < .05 indicated statistical significance. Written informed consent was obtained from all patients, and the procedures were approved by the hospital ethics committee. In all patients, intraoperative angiography showed a resolution of the stenosis. Of the 110 patients, 6 (5.4%) had postoperative ischemic symptoms: 3 (2.7%) had minor strokes and 3, transient neurologic events. None of the operative procedures led to death or myocardial infarction. Of the 110 patients who underwent CAS, 98 patients (89.1%) underwent preoperative and postoperative DWI of the brain. Of these 98 patients, 92 were asymptomatic and 6 were symptomatic. In all 6 symptomatic patients, postoperative DWI detected new ischemic lesions. In 14 of the 92 asymptomatic patients (15.2%), DWI disclosed 33 new lesions (range, 1–7 lesions; mean, 2.2 lesions per patient). Of these 33 new DWI lesions, 26 (79%) involved the vascular territory supplied by the treated ICA, whereas the other 7 lesions (21%) were located in other territories (contralateral lesions). Of the 33 lesions, 19 (58%) were anatomically situated in the cortex, 10 (30%) were subcortical, 3 (9%) lay in the deep white matter, and 1, in the putamen (3%) (Table 2). Twelve of the 19 cortical lesions (63%) and 4 of the 10 subcortical lesions (40%) were <5 mm in diameter (P = not significant). Overall, 19 lesions (58%) were sized <5 mm and 14 (42%) were >5 mm. None of the lesions exceeded 10 mm in diameter (Table 3). No significant relationship was found in our series between the development of new ischemic lesions and the type of stent or filter used. After a mean follow-up of 6.2 months (range, 4–9 months), 13 of the 14 patients with silent postoperative lesions on DWI underwent a late MR imaging examination. In 8 of these 13 patients (61%), late MR imaging studies detected a brain infarction in the same site as the postoperative DWI lesion, yielding a patient reversibility rate of 39%. Of the 30 DWI lesions followed up with time, only 12 persisted, accounting for a lesion reversibility rate of 60% (Fig 1). Late MR imaging detected no lesions in new brain sites. None of the factors investigated (presence of microinfarctual brain, age ≥80 years, presence of echolucent plaque, or patients’ preoperative presentations) significantly influenced the patient reversibility rate (Table 4). A, Ischemic lesion (arrow) seen on postoperative DWI. B, Delayed MR image in the same patient documents its disappearance. A possible reason why we found a lower reversibility rate is that we used a more sensitive MR imaging technique (3-mm sections instead of 5 mm). Another explanation, given our finding that lesion reversibility depends significantly on size, is that our patients had relatively few small lesions (59% <5 mm in diameter versus 81% in study by Hauth et al16). Even though prolonged antiplatelet therapy with clopidogrel may prevent thrombus formation on embolic material, thus causing ischemic lesions to disappear, this mechanism would be unlikely to explain why our reversibility rates differed from those of Hauth et al, given that in both studies patients discontinued clopidogrel at 6 months. Whatever the explanation, overall, these findings imply that permanent cerebral ischemic damage after protected CAS is less extensive than postoperative neuroimaging studies suggest. When we analyzed factors that might influence lesion and patient reversibility—location, size, MR imaging documented microinfarctual brain, age ≥80 years, sonographic evidence of echolucent plaque, and clinical preoperative presentation—the only factors clearly associated with persistence were location and size (Tables 2–4). Our study suggests that the silent DWI ischemic lesions most likely to persist with time are those located in a subcortical site and those >5 mm. Location and size are, nevertheless, closely related because, as our study shows, subcortical lesions are also frequently larger than cortical ones. The lower reversibility of subcortical lesions could, therefore, depend on both their larger size and the known poorer subcortical vascularization. Even though assessing cognitive decline was outside the scope of this study, our finding that many silent postoperative ischemic lesions merely caused transient ischemia without sequelae could help to explain the controversial association of these lesions with cognitive decline.19 Whereas some report neuropsychological deterioration in patients with postoperative DWI lesions after coronary artery bypass grafting,20 others do not.21–23 To our knowledge, no information is available on the association between cognitive decline and silent postoperative DWI lesions after protected CAS. As our study shows, definitive conclusions on this possible relationship should be drawn not from immediate postoperative assessment but from delayed evaluation of CAS-induced ischemic damage. In conclusion, although increasing data show a high incidence of postoperative brain ischemic damage after protected CAS, many of these silent ischemic lesions, particularly the smaller and more distal ones, disappear at MR imaging follow-up. Further studies addressing the association of persistent ischemic lesions with cognitive impairment are needed to evaluate long-term results of protected carotid stent placement. Accepted after revision February 21, 2008.